No, it isn’t quite the ending I’d planned when I’d pitched for the series, but I am extremely proud of the work my collaborators and I put out there, and greatly appreciate the opportunity. 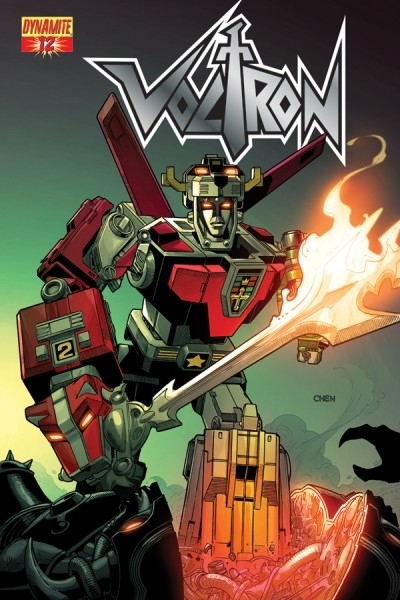 This particular issue is the best thing I’ve ever had published (so far), and think it’s clear that I’ve learned a thing or two in my 18-issue journey through the Voltron mythos. Hope some of it is well remembered in the years to come, especially the work we put into Sven, the Voltron Force’s most misunderstood (yet incredibly awesome) member. Thanks to my fellow creators and artists: Ariel Padilla, Craig Cermak, N. Steven Harris, Marcelo Pinto, Adriano Lucas, Marshall Dillon, Simon Bowland, and the phenomenal cover artists that got people to pick up the book in the first place: Alex Ross, Sean Chen, Admira Wijaya, Wagner Reis, and Jack Herbert. Additional thanks go to Nick Barucci and Joe Rybandt, the guys who put us all together, were a joy to work with, and were always willing to let me tell the story I wanted to tell. Hope to work with you all again sometime in the near future. Thanks to Jeremy Corray and Tiffany Ilardi, who made me feel like some kind of big time writer guy by flying me out for signings and putting me on panels at giant conventions. Finally, thanks to the fans that truly loved what we were doing all the way. Appreciate interacting with you on the Voltron boards and in person at the shows. Made some new friends throughout this entire process, and that’s what I’ll ultimately take with me. See you all soon and thanks for the support!